Four squirrel monkeys died in a nicotine addiction study halted by the U.S. Food and Drug Administration. (CNN) - A decision by the U.S. Food and Drug Administration to shut down a nicotine addiction study has stirred debate about what the future holds for medical research on animals. 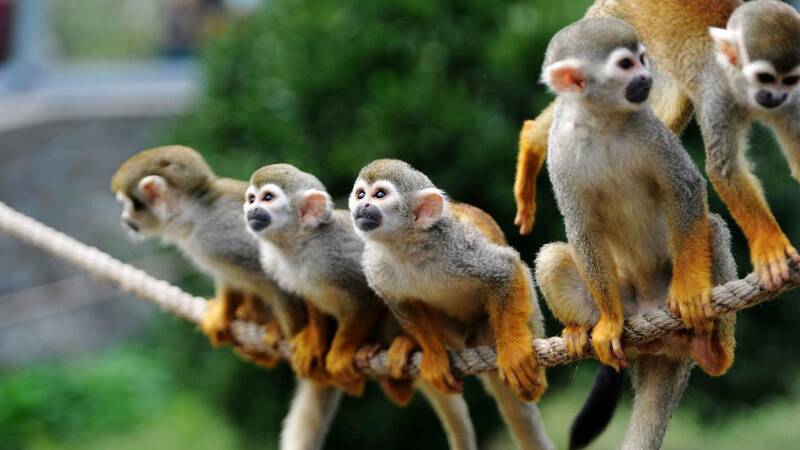 The agency ended the study after the deaths of four squirrel monkeys involved in the research. The study -- intended to investigate the role that various levels of nicotine play in the onset of nicotine addiction in teens and young adults -- had been placed on hold and put under review to determine the safety and well-being of the animals involved. Now, the 26 remaining animals will be placed in a permanent sanctuary home, and the FDA is working to establish an Animal Welfare Council to oversee all animal research under the agency's purview, Commissioner Dr. Scott Gottlieb said in a statement last week. While animal rights activists celebrated the move, some scientists raised concern about why the decision was made -- and what it could mean for the future of medical research. Humans have been using animals as models in research since the earliest days of medical science. Yet in recent years, activists and scientists have debated whether the role animals play in some studies should continue. In wake of the FDA's latest decision, that debate will continue. In 2014, the FDA's National Center for Toxicological Research moved forward with a study to examine the behavioral and biological effects of nicotine in squirrel monkeys and to better understand how reducing levels of nicotine would impact them. After learning about the study, the White Coat Waste Project, an advocacy group working to stop taxpayer-funded animal experiments, filed a Freedom of Information Act request for documents and additional materials related to the study. The group claimed that the response it received didn't comply with its request, and in August, it sued the FDA. In September, world-renowned primatologist Jane Goodall wrote a letter to Gottlieb indicating that she was "disturbed" and "shocked" to learn that the agency was still performing nicotine addiction experiments on monkeys. Gottlieb responded to Goodall in a letter: "After learning of concerns related to the study you referenced, I directed the agency to place a hold on the research study earlier this month. Accordingly, at this time, all experimentation involving the monkeys in the study you referenced has been halted." The FDA decided to put a permanent end to the study after veterinarians and other animal-care professionals conducted a site visit at the National Center for Toxicological Research to evaluate the monkeys involved, Gottlieb said in his statement last week. "Based on this team's findings, it is clear the study was not consistent with the agency's high animal welfare standards and why the agency has permanently ended this study and will place the monkeys involved in a new permanent sanctuary home, which will provide them with appropriate long-term care," Gottlieb said in the statement. "However, our work is not done," he said. "These findings indicate that FDA's animal program may need to be strengthened in some important areas. As such, I am taking additional steps to ensure that any concerns related to current processes and procedures have been addressed and to identify additional actions the agency might take to better ensure the welfare of the animals in our care." Animal studies are intended to test medical products when non-animal testing is not yet a scientifically valid and available option, according to the FDA. Some in the biomedical research community have expressed concern that the FDA's decision appears to have been made in response to animal rights groups pushing for an end to animal studies, said Matthew Bailey, president of the Foundation for Biomedical Research, a nonprofit that promotes public understanding and support for such research. "Research into the effects of nicotine is indeed a public health issue, especially given the rise in popularity of vaping devices among teenagers," Bailey said of the FDA's now-terminated study. "My understanding is that the research project in question aimed to determine whether there is or is not a safe level of nicotine absorption by young people," he said. "That's an important question." Bailey added that it remains unclear what the FDA's newly established Animal Welfare Council would do beyond the already federally mandated Institutional Animal Care and Use Committees. These committees, mandated under the Animal Welfare Act and the Health Research Extension Act, provide oversight for most institutions using animals in research, teaching and testing. FDA spokeswoman Tara Rabin wrote in an email that individual animal care committees are tasked with study-specific oversight, but "the newly established Animal Welfare Council will track all studies across the FDA and provide centralized oversight and coordination of all animal research activities and facilities under the agency's purview. This Council will advise on the agency's approach to animal welfare issues and ensure alignment of animal studies with the agency's mission." There are about 270 non-human primates under the FDA's care and 10 active animal studies involving non-human primates, she said. The U.S. National Institutes of Health funds most of the basic medical research conducted across the country, and every academic institution it funds that conducts medical research with animals is required to have an Institutional Animal Care and Use Committee to oversee care of those animals, according to the institutes. The institutes will not fund research that uses animals if the committee has not given its approval to the proposed study. Though many studies across the U.S. are federally funded, many others are conducted as private research. For instance, biotechnology and pharmaceutical companies, sometimes in partnership with the National Institutes of Health, conduct animal studies. "The laws and regulations governing animal research conducted in the United States are among the strictest in the world, and each is designed to protect the welfare of animals in a laboratory setting," Bailey said. "Researchers consistently work to reduce the number of animals used, replace laboratory animals with other means where feasible and refine the methodologies of experiments involving animals," he said. "Additional oversight efforts need to be balanced by efforts to reduce the significant amount of regulatory burden felt daily by research scientists in the U.S."
Some politicians celebrated the FDA's decision to shut down its nicotine study and establish a council to review future animal research. "Throughout my career, I have consistently worked to end wasteful and abusive experiments on animals," California Rep. Ken Calvert wrote in an email. "I applaud the Food and Drug Administration for halting these controversial monkey nicotine tests and taking action to protect these animals." Arizona Sen. Jeff Flake wrote in a email, "Addressing addiction is an important issue but wasting millions of dollars on this type of monkey business is totally bananas." Nevada Rep. Dina Titus also opposes the monkey testing and wrote in an email, "Now that the FDA has canceled these studies, I'm working to ensure the animals are relocated to a suitable sanctuary and we end other cruel, unwarranted government testing on animals." Justin Goodman, vice president of the White Coat Waste Project, called the FDA's decision a "huge win" not only for animals but for taxpayers. "A majority of Americans oppose taxpayer-funded animal experiments, and we are pleased that Scott Gottlieb has heeded the calls from the American public," Goodman said. "There's a stunning lack of transparency and accountability about how the government is spending our money in animal laboratories, and it's critical that taxpayers speak up, because it's clear that they can make a difference," he said, adding that the majority of drugs shown to be safe in animal studies end up failing in human clinical trials. "Nicotine experiments on monkeys have not improved public health," he said. "The FDA has decided that it's in the best interest of the agency, taxpayers and animals to end the project and to send the primates to sanctuaries where they belong." In his statement, Gottlieb noted that "there are still some areas for which non-animal testing is not yet a scientifically valid or available option. For example, animal research with primates continues to be an essential part of the safe and effective development of certain critical childhood vaccines." The FDA conducted a study in baboons that found that whooping cough vaccines to be effective in preventing the disease among those vaccinated but that vaccines may not protect against transmissible infection from the actual bacteria behind whooping cough. So the bacteria could spread to other people, including those not vaccinated. The study, published in the Proceedings of the National Academy of Sciences in 2013, also offered some clues to the recent resurgence of whooping cough. Bailey said it's difficult to find a medical advance that hasn't been informed in some way by animal research. "Animals played a role in the development of each of the top 25 most prescribed drugs in America," he said, adding that our pets, farm animals and wildlife also benefit from medical treatments developed in part from animal research. "Farm animals and wildlife are routinely vaccinated against any number of diseases, but those vaccines wouldn't be available without animal research. So if you love animals, you really should support animal research," he said. "Undoubtedly, some will argue that this recent action by the FDA is a reason to end research with animal models. But given the inextricable role humane and responsible animal research plays in the health of the overall population, and the health of the animals about which we care so deeply, that is a very dangerous proposition," he said.